Funny enough, not a single Standard card cracked the top ten. Only Arclight Phoenix showed up, and the ship on that card has already sailed. Okay, so there’s not much to discuss there. Besides, Quiet Speculation’s own writer David did a fantastic job covering all the relevant Pro Tour news throughout the weekend. There is little for me to go over here, and in light of the lack of price action, I think my attentions are best spent elsewhere. This week I wanted to cover a different class of cards that shows up frequently on MTG Stocks. Only they wouldn’t be in the list above. Instead, I am talking about the foils. Specifically, I want to cover some of the older foils that show significant movement day in and day out. Are these price spikes real? Is there actual demand? I’m going to do some digging to find out what the market is saying about these obscure gems. Every week there are at least a couple foils from Seventh Edition that show huge gains. The cards don’t even have to be good—as long as they’re from Seventh Edition, any card is fair game. Just look at the second biggest mover of last week, Wall of Air, allegedly jumping from under a buck to $8.99. This trend repeats itself time and again. But how real is the movement in Seventh Edition foils, and why these in particular? Seventh Edition was the first Core Set to include foils, which used black borders instead of white borders. Thus, these foils are very attractive relative to their nonfoil counterparts. Furthermore, Seventh Edition was the last base set printed with the old frame. Putting two and two together, Seventh Edition foils are the only Core Set foils that use the classic card frame. This makes them fairly unique already. There’s also a theory that foils appeared with less frequency in Seventh Edition product. If this is true, it adds to a recipe for high collectibility and higher prices. This could explain stuff like foil Goblin Matron being $85 despite being only an uncommon. This is a playable card in Legacy (at least, it was once upon a time) and the Seventh Edition foil printing is the only one of its kind. Birds of Paradise’s crazy price tag is even more justifiable. But…Wall of Air? I’m not so sure about that one. According to Trader Tools, the top buylist on this foil is $1.80 (Card Kingdom). 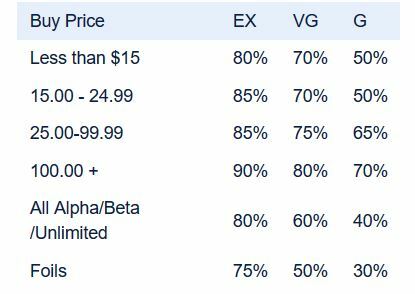 That’s a far cry from the supposed $9 price tag indicated by MTG Stocks. One look at TCGplayer and we can determine why this discrepancy exists: there are only 2 LP foils and 1 NM foil in stock, all from the same seller. This seller, in turn, can charge whatever they want, which would get reflected on MTG Stocks accordingly. Talk about power! I checked eBay for completed listings of Seventh Edition foil Wall of Airs and, including shipping, recent sales were $4.40, $2.75, $1.98, $5.74, and $4.74. This averages to $3.92, which sounds far more realistic for this card. Card Kingdom’s retail price is $3.99. Thus, I believe this card is worth about $4 and not $9. Can this change now that the card was “bought out?” Possibly, but I don’t think so. Despite the rarity of these foils, the collector demand for them is very small—how many people do you know collect Seventh Edition foils? This goes beyond Wall of Air, too. I see that Giant Octopus spiked most recently, yet none of this price increase is reflected on Trader Tools or eBay. In fact not a single foil Seventh Edition Giant Octopus has sold on eBay in the past few months. The rarity of Seventh Edition foils can drive very high prices, but I believe the cards have to be playable somewhere for that price to stick. 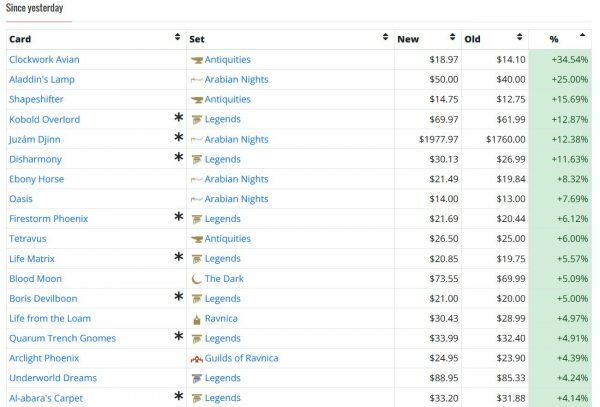 Foil Fire Diamond buylists for $30—well, it’s in over 6,000 deck lists on EDH REC, so no wonder it is worth so much! Granted there are exceptions, and just about any foil Seventh Edition rare is worth something (much like any Unlimited rare is worth something). The rarity alone makes these highly desirable. But in general, if you’re going to deal in Seventh Edition foils make sure you stick to the playable, nice condition stuff. What about other random, older foils? Foil Spy Network from Onslaught spiked from $0.57 to $4.28 recently. More notably, foil Invasion Molimo, Maro-Sorcerer jumped from $3.50 to $18.50. Are these relevant moves? I’m not so sure. For example, not a single foil Molimo from Invasion has sold on eBay in the past few months. If this card suddenly had higher demand, wouldn’t at least a couple of the $10 copies on eBay sell? The top buylist is $4.95 (Card Kingdom)—granted this is higher than the “old price” of $3.50, but it’s a far cry from the $18.50 price tag reflected on MTG Stocks. There are exactly 112 lists that contain Molimo on EDH REC, so demand is going to be extremely sparse. Yet again, this is likely a card with low inventory whose price is being manipulated by a limited number of sellers. Thus my stance on other older foils is the same: stick to the playable stuff in nice condition and avoid the rest. Old foils do merit a premium, but good luck selling, say, foil Viashino Heretic for $20. The last one that sold on eBay went for $8. That’s surprisingly high, but it is nowhere near what people are asking on TCGplayer. There are plenty of ways to invest in old foils. I’d advise browsing the older sets for cards that see at least some Pauper or Commander play and buy accordingly. But I need to emphasize one bit of caution when dealing with old foils: condition is huge. You need to pay very close attention to condition and avoid the played stuff. It’s going to be much harder to move for profit, and buylists will punish you dearly on played foils. For example, Card Kingdom will pay you a reasonable $6.50 for a near mint foil Nemesis Saproling Burst. That’s a pretty solid price. But Card Kingdom’s condition downgrades on foils are brutal! They’re even worse than their Alpha/Beta/Unlimited downgrades! Take a look! Thus a slightly played foil Saproling Burst will net you $4.88. And if your copy is played, you’re looking at $1.95 to $3.25. The multiplier doesn’t sound as scary with a $10 card, but when you’re looking at some of the high-end foils you can be looking at a major drop in payment. 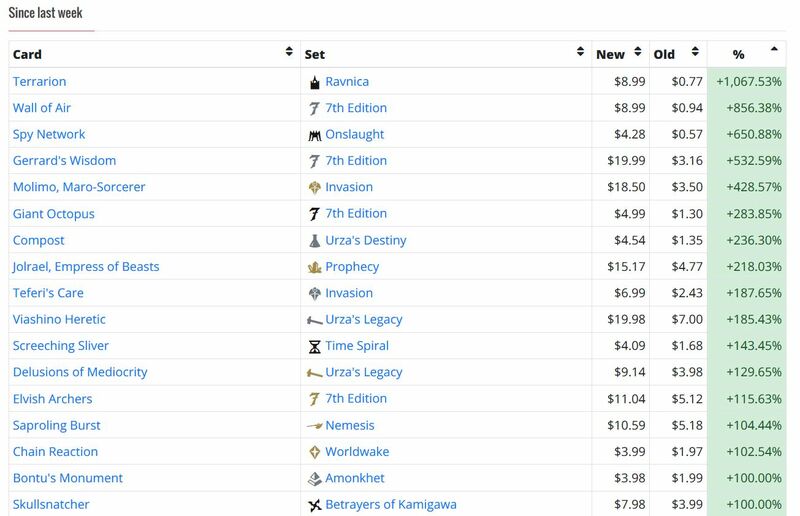 Not long ago I sold a foil Radiant, Archangel to Card Kingdom’s buylist because I had a tough time moving it at the “new” price (no surprise there). They graded it VG and I got only half what I had expected. You need to be extremely careful with foil grading because smudginess on the face of the card can be hard to notice without the right reflection of light. Card Kingdom isn’t the only vendor with this kind of foil multiplier. I looked up Star City Games’s buy price on Saproling Burst and I see a similar trend. They’ll pay $4 for near mint, $3 for PL, and only $1 for HP. Vendors don’t want played, obscure foils because collectors don’t want them either. If the card is played in Legacy or Commander, maybe played copies aren’t so poisonous. But if you’re dealing in older foils that spike randomly on TCGplayer, avoid the played stuff like the plague. I keep seeing random, old foils popping on MTG Stocks and I wonder every time if the movement is real or not. While there are collectors out there who want these foils, I’ve concluded that flipping these random foils is a fool’s errand. You may get lucky of course. But flipping obscure Nemesis foils for profit must be very tough. I suppose if you’re in it for the long haul, you could stand to make some money holding foils from Mercadian Masques and Urza’s block. These are so old and so rare that they’re bound to climb in price over time. But I’m not sure if it’s the best place to park money. I’d rather focus on near mint copies of cards that see actual play. Of course, most of these are already expensive—just look at something like foil Replenish. But I’d much rather sink some money into a card like Seventh Edition foil Fire Diamond, that sees a ton of Commander play, than foil Wall of Air, that is only going to sell to a collector. You’ll be paying a premium, but you’ll also have an easier time moving the card after it matures. Lastly, avoid the played stuff. This used to be the same rule when it came to Alpha and Beta cards, but with Old School demand even heavily played cards sell easily if it fits into Old School decks. But there’s no equivalent for Seventh Edition foils at the moment. Therefore, collectors are your main customer and they’re going to want nice-looking copies. I’ll let you know if that ever changes. In the meantime, older foils can definitely hold a solid spot in your portfolio. But before jumping in head first and chasing TCGplayer buyouts, make sure stick to nice condition, playable cards, and you should do just fine! There are definitely some solid buy prices on old foils at Card Kingdom, as long as you have truly near mint copies. For example, you can bank $200 for your near mint foil Yavimaya Hollow! Being on the Reserved List, this is one card that will only climb in price over time unless it’s completely overshadowed by power creep—that isn’t likely. Dust Bowl isn’t even on the Reserved List, but its playability and the rarity of its foils makes this card highly desirable. Card Kingdom is offering $42.50 on near mint foils! The amazing thing is even if this card saw a reprint, I’m not sure the original foil price would be hurt all that much. The original foil copy is simply that rare! I know Seismic Assault makes occasional waves in Modern, but let’s be honest here: it’s not a highly playable card. It also has little utility (if any) in Commander. 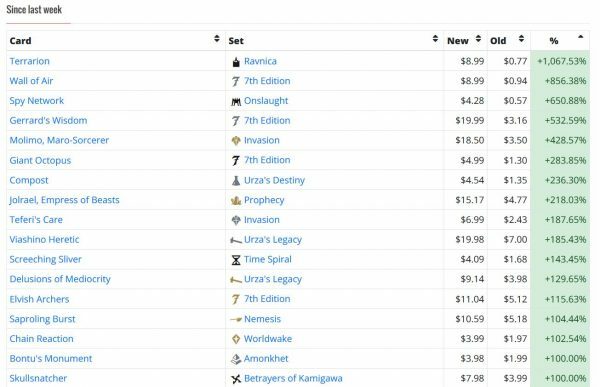 Yet Seventh Edition foils buylist to Card Kingdom for $48! The lesson here: an old foil doesn’t have to be all that good! If it sees even occasional play, the old foil versions can become quite costly! There’s just not enough supply to go around. This is not a theory, the packs literally tell you the odds of opening a foil and 7th has much worse odds than newer sets. Additionally 7th was not a popular set, thus comparatively little was opened.